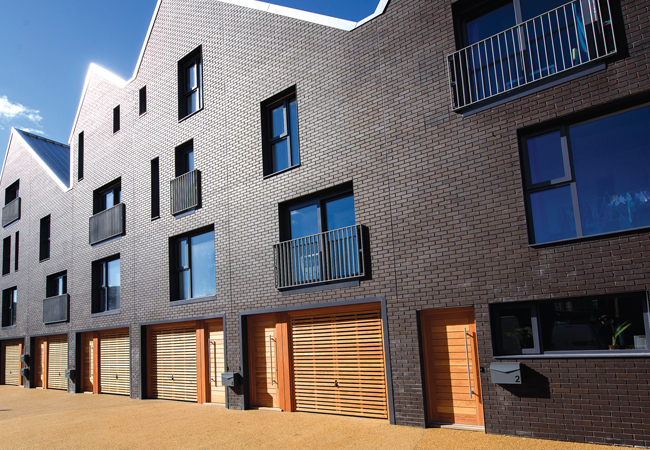 CIBSE Yorkshire Award-winning project Little Kelham is a mixed-use development, built on the site of a former steelworks in Sheffield. The masterplanner was Sturgeon North Architects, with detail designed by Bauman Lyons Architects. The residential element of the scheme comprises 151 – predominantly two-, three- and four-bedroom – apartments and houses. These are built from structural insulated panels (SIPs) and have been fitted with triple-glazed windows to deliver homes with a SAP A rating and heat losses lower than the minimum required under current Building Regulations – see box, ‘Typical fabric U values for Little Kelham homes’. The SIP system delivered an airtight solution with an air-leakage rate of less than 1.0m3.h-1.m-2 for all the properties. Leeds Environmental Design Associates (LEDA) was appointed in 2015 to design the heating, hot-water and ventilation systems for the homes. ‘We’ve done lots of housing work, so we understand how to heat a low energy house,’ says Matthew Hill, director of energy consultancy and building services engineering. The developer, CITU, wanted the homes to be all electric and the heating system to be hidden from view. It should have been a fairly straightforward assignment for a new development of highly insulated homes; however, some of the properties had already been built, while others were under construction. 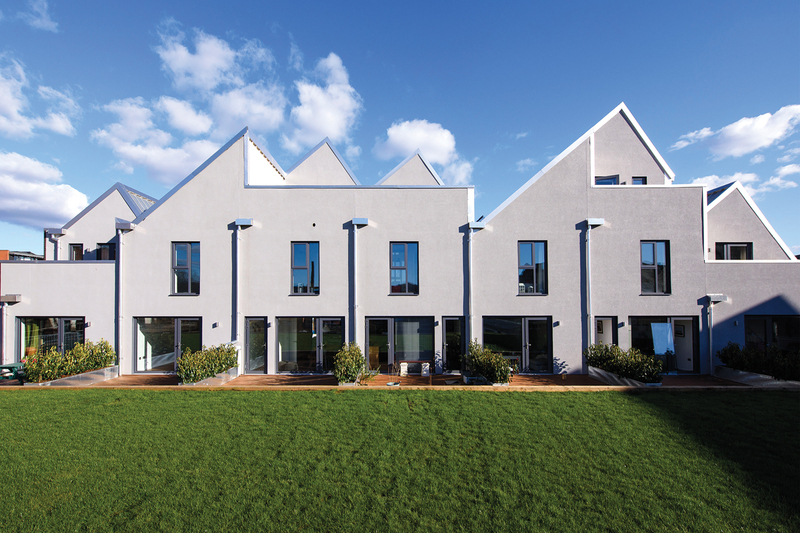 ‘We became involved after the first terrace of houses had been completed and construction of the second terrace was under way,’ says Hill, who adds that it was already ‘too late to pursue a large-scale community heating solution’. Instead, the consultant opted to heat the homes on an individual basis. ‘Because the floors had already been installed in the houses, we went for the innovative solution of putting electric heating mats, embedded into the internal walls, in some of the rooms,’ says Hill. The mats, he adds, are ‘the sort of thing you’d expect to find under the floor of a bathroom’ – and they work because the dwellings are so well insulated. The total heat demand for a three-bed terrace house is no more than 2kW. The mats are installed in the living and dining rooms, kitchen and bedrooms, each of which has a maximum heat requirement of less than 400W. According to Hill, ‘a few square metres’ of mats is sufficient to meet the heating demand. Because heating mats are not often fitted to walls, LEDA had to work with the product suppliers and the contractor to ensure they were installed correctly. This involved glueing the mats to the plasterboard inner lining of the SIP panel, using tile adhesive. The mats were then covered with a layer of tile adhesive before a second layer of plasterboard was attached on top of the mat. ‘The key to the installation was to ensure there were no air pockets, to maximise the mat’s radiant heat output,’ explains Hill. Interestingly, tests showed that convection from heat mats in the walls was greater than from the ones installed in the floor, so a smaller area of heat mat could be used. The location of the mats within a room was important, though. Residents are given documentation to tell them where the heating mats are installed, so they can keep the walls clear. This also prevents mats from being damaged by occupants fitting picture hooks, for example. An advantage of the heating-mat solution is that it allows occupants to control temperatures on a room-by-room basis. The electric heaters also work independently of the property’s mechanical ventilation system with heat recovery (MVHR). The consultants did consider using electric heat pumps to deliver heat to the project. 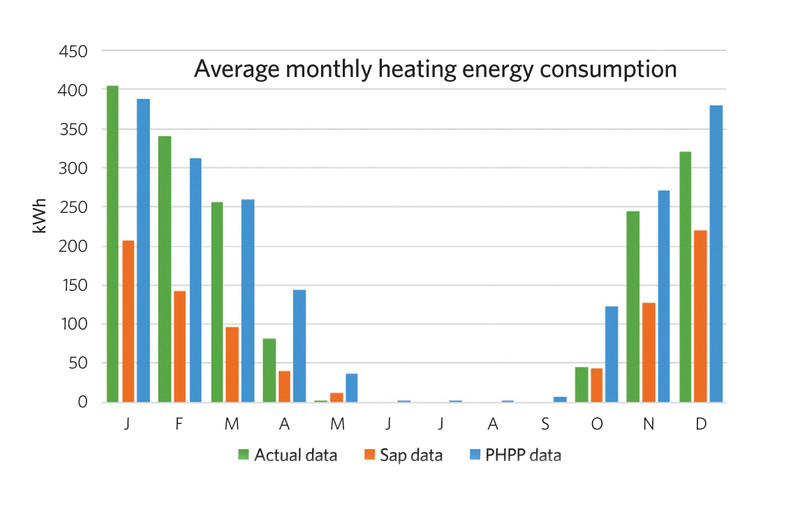 However, energy consumption for hot-water provision in these houses is typically 53% of the total energy consumed for both heating and hot water, so most of the heat pump’s output would be needed to meet hot-water demand. ‘Air-source heat pumps are OK for low-temperature heat applications, but their coefficient of performance is not good when heating hot water to more than 55°C,’ explains Hill, who adds that the same argument is true for ground-source heat pumps. These also have a high capital cost for housing schemes because there are no piles in which to install the heat-collection coils. The Little Kelham scheme will have an extensive roof-mounted PV installation, which will generate electricity for the development. The building services consultant has supplied detailed modelling of PV panel locations on site, as well as anticipated usage profiles and PV output, so that CITU can optimise the array sizes. According to Hill, if PVs are fitted to all suitable roof areas, the potential peak output could be as much as 720kW. ‘We worked out that the development would be able to use the vast majority of this,’ Hill says. The PV-generated electricity will feed into a substation commissioned by CITU, from where it can be sent to the grid or used to supply the homes through what Hill calls ‘a private electricity network’. Unusually, the developer has set up Little Kelham Utilities to buy electricity and water collectively for the community. 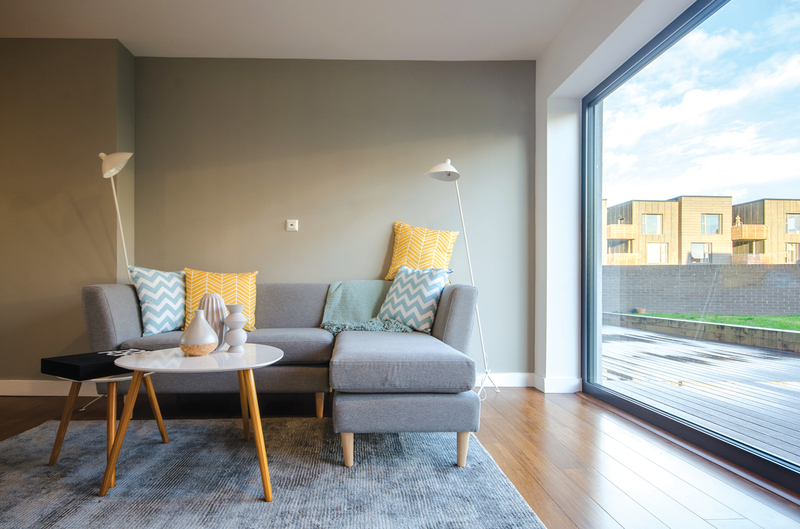 It is owned by the Little Kelham Community Interest Company (CIC) and residents become members of the CIC automatically, through home ownership, as do the site’s commercial tenants with long-term leases. The scheme includes a community data infrastructure – which delivers fibre optic directly to the homes – plus a controls network for monitoring. This system makes it easy to meter and manage energy consumption. ‘Because the scheme is so well metered, they can have real-time information on the operation of every heater and immersion heater, so will be able to set up the electric immersion heaters to operate at off-peak times to smooth out demand, or when the PV output is high,’ says Hill. The developer has also created a smartphone app to enable occupants to control their home and monitor their energy use. It will be further developed to notify residents to turn on their washing machines, for example, when the PV output is high, and to allow them to turn off lights and appliances remotely when they are out of the house. In addition, the developer is looking to encourage residents to charge electric cars at peak output. ‘Our modelling of the PV showed that demand management is a much better option than trying to put in a lot of battery storage,’ Hill says.